Yep, this is us. All of us. Because that’s out Mama who wrote Poison Paw and a few other stories, but none in the Bundle. She says we are mostly good cats, although I do not believe it of Ham. While she was gone at Superstars, he attacked me and when my dad came home he found fur and a few poops all over the bathroom. Of course, Mama says I start it because if Ham gets close to me I bop him hard on the nose. I do not know why he gets mad. But you know all of us here anyway because we’ve been here. So just keep following us and we will let you know when Mama has another story or book out. 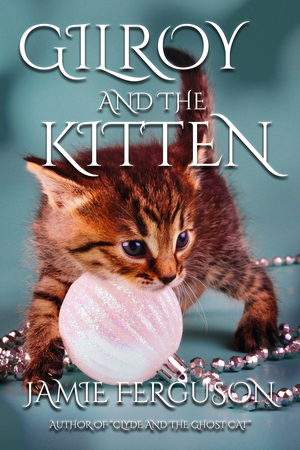 Oh wait–she does have a new book out but it has no cats at all! It’s a Gothic ghost story set in modern times called Ghosts from the Past. 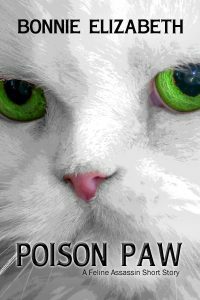 So if you’ve read and liked “Poison Paw,” in the Fantastic Feline Heroes Bundle, you might like the ghost story too. Or not. Eric is another one of the writers who only has dogs right now. Apparently Lucky is a rather active dog and a cat isn’t likely to be happy in the household right now. 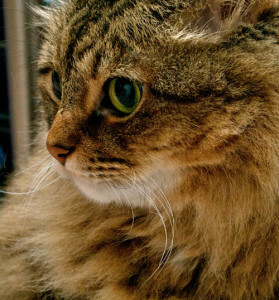 Before Lucky, there was a cat named Nym. How can you not love that name? I like that word, “smoft”. I am smoft! I didn’t know that, but I like it! 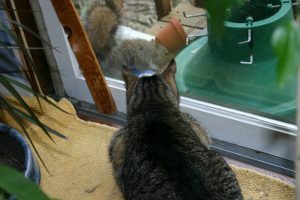 As you can see in the second photo, Nym clearly had cat TV too! And he liked it. 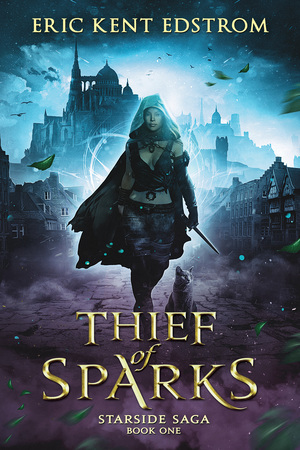 Eric’s story in the Fantastic Feline Heroes Bundle is Thief of Sparks. It’s a real treat to get the novella that starts off the whole series, so if you love it there’s more. Oh and here’s more Nym too. Kristine Kathryn Rusch’s cats have been on our website before. She has since lost the cats she spoke about then. 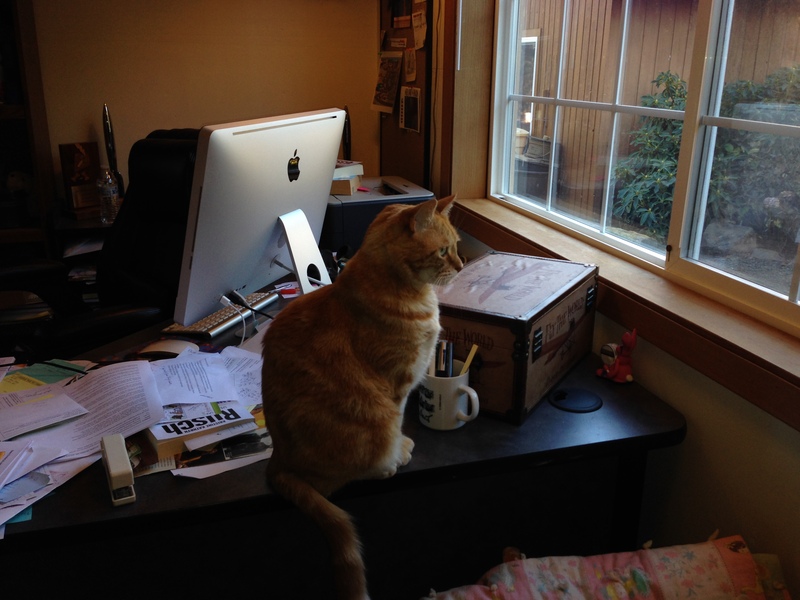 Galahad, or Gally, was her muse for 15 years, helping out in her office and we’ve featured him here. 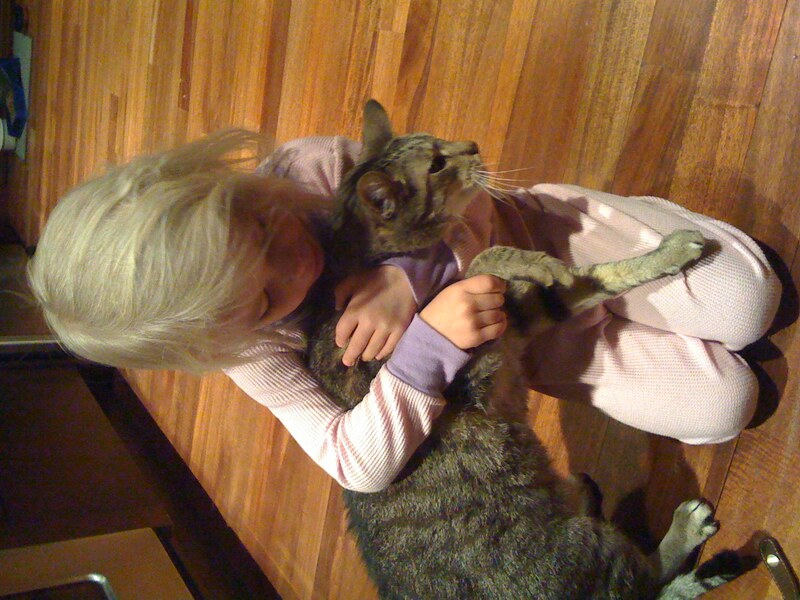 She lost him not long after we lost Chey. The Bridge got some stunning cats that summer and there were many tears. 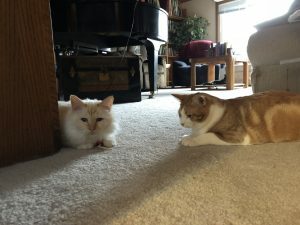 Kris and her husband Dean Wesley Smith have had a lot of cats and if you follow her on Facebook, or follow Dean’s blog, you’ll often hear about them finding a stray and taking it in or adopting another cat from a shelter. If you’re a cat lover, Kris is definitely someone to follow on Facebook to hear about her feline adventure. 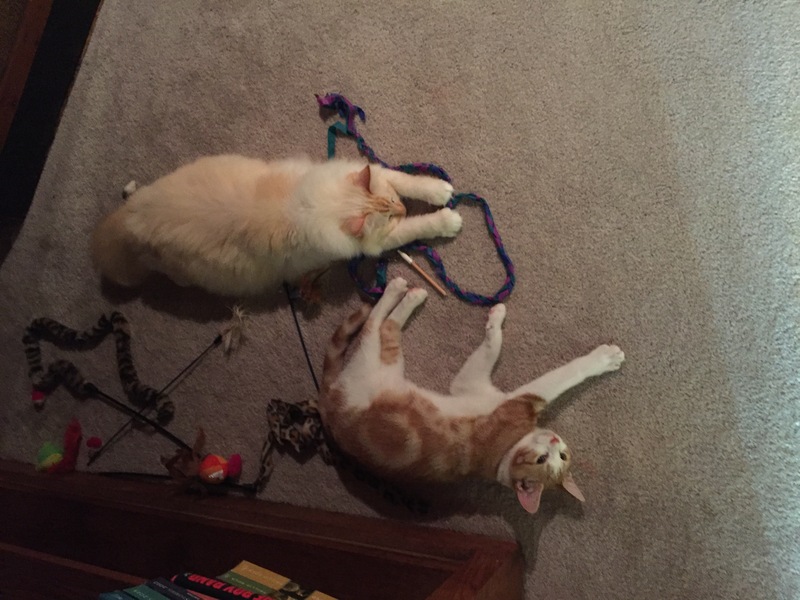 Cheeps came to them and was very shy at first but he’s blossomed into a loving mancat. Gavin is the latest addition to the family and he and Cheeps have a grand time together. 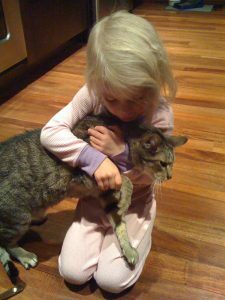 Our long time readers probably remember that Mama got to have a guest post by Kristine Kathryn Rusch on our blog a number of years ago. She was so happy and jumping around about this. Kris has long been one of Mama’s favorite authors. At any rate, we are thrilled to have “Disaster Relief”, a Winston and Ruby story, in the Fantastic Feline Heroes Bundle. At any rate, the accolades for Kristine Kathryn Rusch are long. She has some other great cat stories. You’ll find some in Five Feline Fancies. One of her more recent books, under her Kris Nelscott pen name is The Protectors. It’s set in the same era as the Smokey Dalton series (which Mama highly recommends). 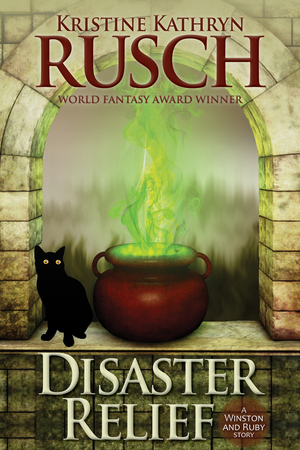 New York Times bestselling author Kristine Kathryn Rusch writes in almost every genre. 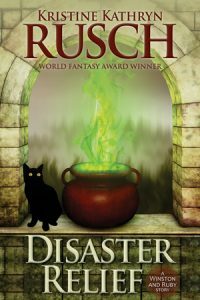 Generally, she uses her real name (Rusch) for most of her writing. Under that name, she publishes bestselling science fiction and fantasy, award-winning mysteries, acclaimed mainstream fiction, controversial nonfiction, and the occasional romance. Her novels have made bestseller lists around the world and her short fiction has appeared in eighteen best of the year collections. She has won more than twenty-five awards for her fiction, including the Hugo, Le Prix Imaginales, the Asimov’sReaders Choice award, and the Ellery Queen Mystery Magazine Readers Choice Award. And she and her husband have cats. You’ll meet them soon! 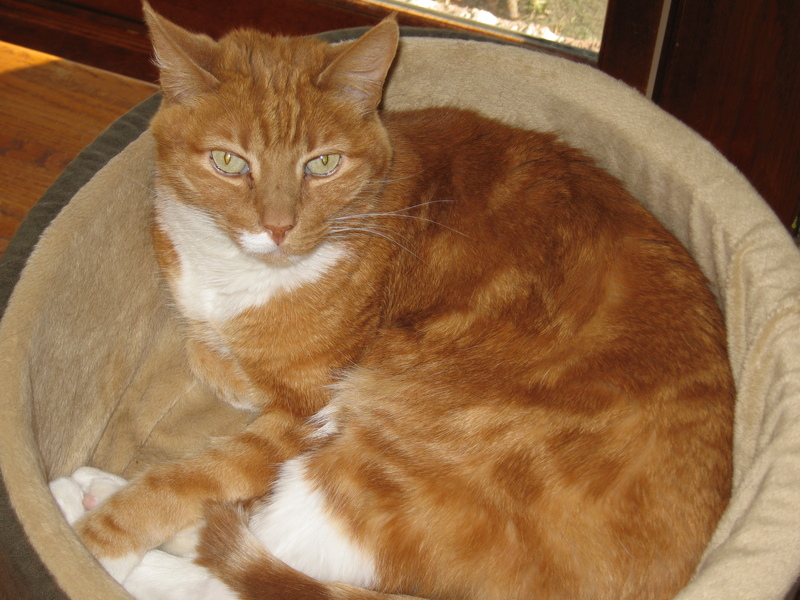 We promised cats, so we want to introduce you to Spiff, who belonged to author Jamie Ferguson. 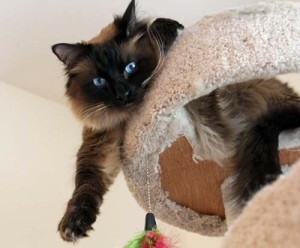 Right now, Jamie only has dogs but even looking at pictures of Spiff, she misses having a cat. Mama said how could she not? Look at that handsome orangeness! Jamie has a number of other stories, some of which include cats. You can find her work at her website. Jamie’s story in Fantastic Feline Heroes is called “Gilroy and the Kitten”. Don’t miss it! 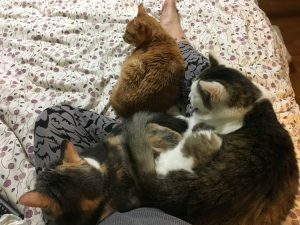 Dayle Dermatis is one of those authors with multiple cats. We’ve heard a lot about her cat stories following her on Facebook. Mama says this is a benefit of knowing authors. You get to hear about their cats too. The clowder at Dayle’s house is currently made up of Goose (top), Clara (left), and Max (right), who you can see here. While not captioned, we think that is the author’s foot. That isn’t something you see every day. 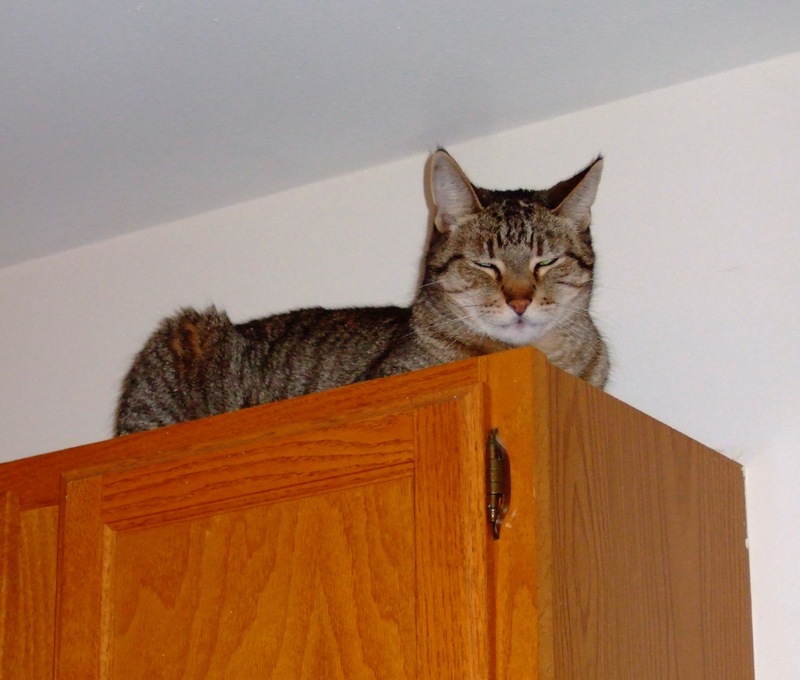 Dayle’s story in the Fantastic Feline Heroes Bundle is “Cecil Stalks his Prey”. We are sure you’ll enjoy it. Dayle’s also the writer who suggested that Milo’s Sanctuary should be one of the charities we used for this bundle and we thought it was a spectacular idea! Mama says Dayle is a whole lot of fun. When she’s around there’s always a lot of laughter. And Mama really enjoys all her stories. 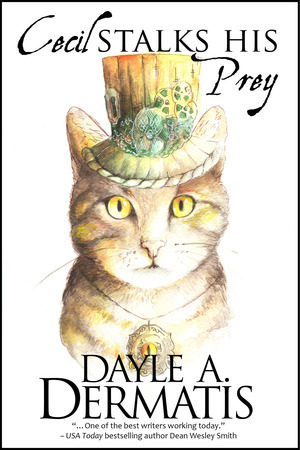 Dayle’s story in The Fantastic Feline Heroes Bundle is “Cecil Stalks His Prey”. Cecil isn’t an ordinary cat. Enhanced feline Cecil keeps his mistress’s house free of vermin and keeps his mistress’s nerves calm as she prepares to display her inventions at The Great Exhibition of London. But when Her Majesty Victoria asks for their assistance, of course they agree. And Cecil must put his skills to work in a unique and unexpected way. Come and experience steampunk London through the ears and nose (and eyes) of a very special cat…. Called “one of the best writers working today” by bestselling author Dean Wesley Smith, Dayle A. Dermatis is the author or coauthor of many novels and more than a hundred short stories in multiple genres, including urban fantasy novel Ghosted. She is a founding member of the Uncollected Anthology project, and her short fiction has been lauded in year’s best anthologies in erotica, mystery, and horror. She lives in a book- and cat-filled historic English-style cottage in the wild greenscapes of the Pacific Northwest. In her spare time she follows Styx around the country and travels the world, which inspires her writing. To find out where she’s wandered off to (and to get free fiction! ), check out DayleDermatis.com. Dayle has another cat related tale, Feline Design, that cat lovers will want to check out as well! 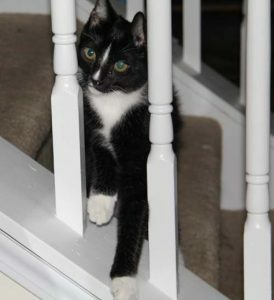 Dayle lives with Goose, Clara, and Max. And you’ll want to stick around to see more of them.